100% Non-GMO Sunflower Oil - 35 Ib. This 35 lb. sunflower oil is an excellent choice for high heat cooking applications. Use it in place of olive oil when you don't want to add the olive flavor, or use it as a healthier alternative to other traditional frying oils. Obtained from milling sunflower seeds, this sunflower oil is naturally processed and contains beneficial antioxidants. It's also a great source of vitamins A and E and essential fatty acids to promote overall health. With its high smoke point, sunflower oil can be used for cooking, pan frying, and baking. Its light color and mild taste is great for sauces, mayonnaise, and salad dressings. Use this sunflower oil to bring something new to your menu or create a slightly healthier take on old favorites. With so many uses and benefits, this 35 lb. 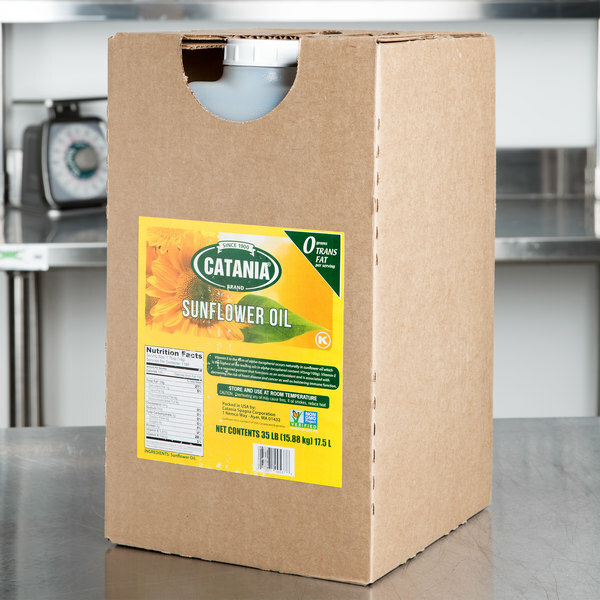 bulk supply of sunflower oil makes an excellent addition to your commercial kitchen! 100% Organic Sunflower Oil - 35 lb. 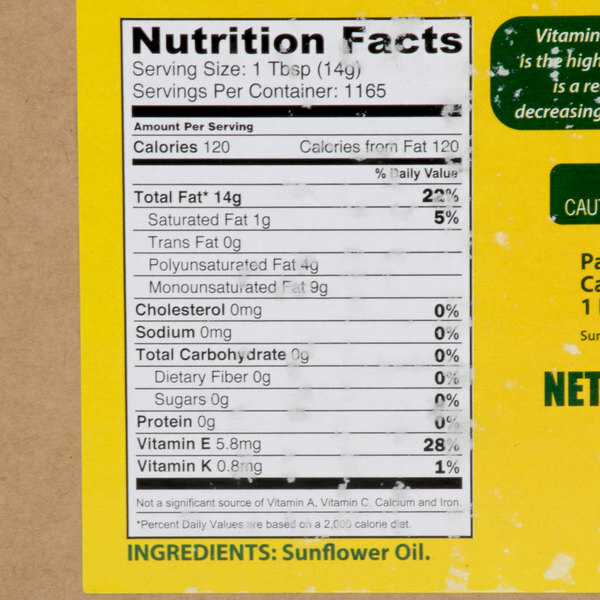 Overall User Rating: 100% Non-GMO Sunflower Oil - 35 Ib. I use this non gmo sunflower in my home made soaps. My customers are very happy with it being the non gmo oil. It is a great price. The non-GMO sunflower oil is a great buy and perfectly priced. The oil is great for frying chicken and leaves no greasy residue. A great find. 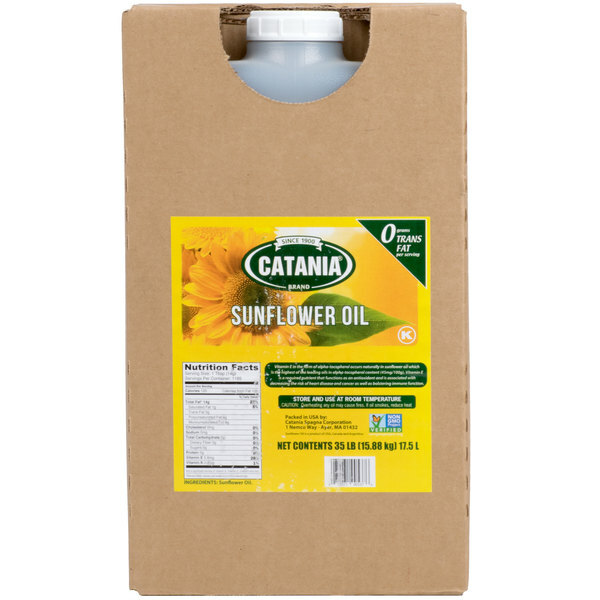 We were glad to find this sunflower oil in a large quantity at a great price. Non-GMO is important to our customers and we use this oil for all vegetable oil applications. Taste and texture are great in our muffins and other baked goods. This oil has a high smoke point, good for frying and I use it for just about all other oil applications. I love that it's non-GMO, very important. The package that it came in was very thin plastic that had a slow leak so that's why I give it 4 stars instead of 5. I love that this oil is Non-GMO. It's perfect for frying, and we sell it in our store in prepackaged amounts so people can have cheap cooking oil that is healthy! High Quality Non-GMO sunflower oil perfect for popcorn popping. High burning point allows it to be a great substitute for other unhealthier oils. No after taste or smells. This is an excellent oil, it has a clear taste that doesn't affect the food that it is cooked in. I'd recommend getting it in bulk to save! Great product for dressings & frying! Packaging also makes the containers stackable which is good for storage when purchasing large amounts. Be sure to inspect when delivered to avoid leak related accidents. I use this oil in just about everything to do with soap and lotion. It is so great at mixing color with for soap. I have also used it to make lotion, and it brings a very light oil to the lotion blend and feels great. It really doesn't have an odor, so that makes it even better. For the price, you can't beat this stuff. It has been lasting a really long time. Awesome quality non-gmo sunflower oil that is great for frying our old fashioned fried pies. The large tub is great and the price is just perfect. What a deal! I got this sunflowerr cooking oil for my deep fryer. My food came out very good even I reused the oil for few time before discard it. It is a healthy oil for high heat cooking. This oil is a fantastic option for heating up your food! It has no flavor so it can be used in a wide variety of dishes.